Author contributions: Angoules AG conceived the issues which formed the content of the manuscript and wrote the manuscript. Conflict-of-interest statement: The author has no conflict of interests. Osteitis pubis (OP) is a debilitating overuse syndrome characterizing by pelvic pain and local tenderness over the pubic symphysis commonly encountered in athletes often involved in kicking, twisting and cutting activities in sports such as soccer and rugby and to a lesser degree distance running. It is a common source of groin pain in elite athletes attributable to pubis sympysis instability as the result of microtrauma caused by repetitive muscle strains on pubic bones. Diagnosis is based mainly on detailed sports history and a meticulous clinical examination, although occasionally is difficult to distinguish this nosological entity from other pathologies affecting the involved area which may occur concomitantly in the same patient. Radiologic examinations such as plain radiographs, magnetic resonance imaging and 3 phase bone isotope scanning may be helpful to differentiate from other clinical entities with similar clinical presentation. Most cases respond well to conservative treatment which includes several physical modalities and especially a progressive rehabilitation programmed individualized to each one of patients diagnosed with OP. Local injection therapies have been also been proposed as a non-operative therapeutic option for the efficient management of these patients. In refractory cases, surgical therapeutic strategies are warranted. These include several open or minimally invasive surgical interventions such as arthroscopic or open symphysis curettage, wedge or total resection of pubic sympysis, polypropylene mesh placement and pubic fusion. In this review a critical analysis of OP in elite athletes is performed with special focus on current concepts of diagnosis and management of this source of athletic groin pain. Core tip: A high degree of suspicion for the presence of osteitis pubis (OP) should be raised at the clinician involved in the investigation and management of groin pain in the elite athletes with repetitive strenuous activities on pubic bones and the surrounding soft tissues. Early recognition of this ailment is imperative to avoid mismanage and to secure early and uneventful return to full sports activities. OP is usually a self-limited pathologic condition and most of the cases recover spontaneously or respond well to conservative treatment. However, in chronic recalcitrant cases, the surgical approach is instituted. No one of the proposed surgical therapeutic strategies until today, is proven to be superior over the other. Osteitis pubis (OP) is a common source of groin pain in athletes, which was first mentioned by Beer, a urologist in 1924, as a complication of suprapubic operations, and later in 1932 this ailment was in greater detail described in an athlete by Spinelli. The term refers to a noninfectious, inflammatory overuse syndrome affecting the symphysis pubis and surrounding soft tissues such as musculature and fascia, mainly in subjects participating in strenuous athletic activities. More specifically kicking, turning, twisting, cutting, pivoting and sprinting activities associated with sports such as soccer, rugby, ice hockey, Australian rules football and distance running have been attributed to this disease[2-4]. Groin pain is a challenging symptom commonly confronting when treating athletes. It is estimated that sports-related injury rates in the groin range from 8% in up to 25% of all injuries[4-6] with a higher incidence in the specific athletic population of male soccer players in which accounts for 10% to 18% per year. In an epidemiological study, including soccer athletes in three seasons 3% to 5% of the total injuries were associated with OP. A higher prevalence of OP in the male gender has also been documented[9,10]. The actual aetiology of this common in specific sports ailment has not been totally clarified. A likely mechanism is the repetitive stress forces applied on the pubic sympysis from the abdominal and adductor muscles which attach to the pubic bones and act antagonistically. The result of this cumulative microtrauma and the alter biomechanics of the affected anatomic area is the symphyseal instability and the establishment of OP lesions[3,11]. Reduced hip internal rotation, which places a supplementary stress upon the pelvic ring when the athlete undertakes turning and twisting and fixation of the sacroiliac joint have been proposed as predisposing risk factor for OP[12,13]. Numerous other cases of OP following pregnancy and parturition have additionally been referred. Rheumatologic disorders including ankylosing spondylitis, rheumatoid arthritis, and osteoarthritis[14,15], and infections following urologic or gynecological procedures have also been associated with this ailment[1,10,16]. Rodriguez et al classified athletes with OP into 4 stages based on clinical findings and diagnostic features (Table 1). Table 1 Stages of osteitis pubis. In this review current aspects of OP diagnosis and treatment in elite athletes are presented with additional analysis of their effectiveness. Clinical manifestations include anterior and medial groin pain, which is exacerbated by walking, pelvic motion, adductor stretching, abdominal muscle strengthening exercises, or movement from a seated to a standing position[15,18] and may radiate into the lower abdominal muscles, perineum, inguinal region, scrotum or medial thigh[16,17,19]. This sharp or aching pain is followed by local pubis symphysis and pubic ramus tenderness and painful adductor muscle spasms. Other symptoms such as waddling antalgic gait and crepitus on examination or daily activities may also be present. Clinical examination includes various tests such as lateral compression and cross leg test as well as pubic symphysis gap test with isometric adductor contraction[10,11]. Verrall et al proposed 3 provocation tests, namely the Single Adductor, Squeeze and Bilateral Adductor tests for the assessment of chronic groin pain following athletic activity. The authors of this study conducted in Australian Rules football players postulated that the aforementioned tests if positive are strongly associated with magnetic resonance imaging (MRI) detected parasymphyseal pubic bone marrow oedema. In addition, local injections in the pubic sympysis with a corticoid and/or anesthetic may be a helpful diagnostic tool for OP. A variety of overlapping medical conditions which cause groin pain should be excluded from the initial diagnosis in order to avoid not only misdiagnose but also mismanage (Table 2). OP may be difficult to be distinguished from adductor muscle strain, and the two conditions may occur concurrently in the same patient. Other etiologies of groin pain commonly encountered not only in athletes but also in general populations, should be taken into consideration. Sports hernia, inguinal wall deficiency, iliopsoas strain, stress and avulsion fractures, intra-articular hip joint injury or other relevant pathology such as snapping hip syndrome, referred low back pain and nerve compression, genitourinary and pubic septic infection should be ruled out[1,11,16,21,22]. Table 2 Differential diagnosis of groin pain[1,11,16,21,22]. It has been thought until the 1970s that a principal cause leading to OP was pelvic infection, which yet has been proven to have a minor contribution to the development of OP. Those two clinical entities, though have a similar presentation. The differential diagnosis may be challenging and the diagnosis of osteomyelitis may take even months to establish. Osteomyelitis usually results from bacterial infection secondary to abdominal surgery or urological, gynecological operations, or may be even of a spontaneous appearance in athletes[25,26]. The possibility of the spread of a nearby infection cannot be also excluded. Abnormal levels of C-reactive protein, sedimentation rate and white blood cell count suggest osteomyelitis but not OP. Bone isotope scanning may not be helpful to differentiate between the two pathologies. Yet joint aspiration may typically reveal pathogenic organisms such as Staphylococcus aureus, Pseudomonas aeruginosa, or anaerobic bacteria with sympysis pubis infection[21,24,27]. Groin pain is commonly attributed to adductor strain in athletes. Adductor strain may coexist with OP and is difficult diagnosed as a separate entity. The diagnosis of this pathology is based mainly on clinical examination. Clinical findings include pain on palpation with focal swelling along the adductors, decreased adduction strength and pain on adduction against resistance[12,16]. To clarify diagnosis an MRI can take place to reveal muscle/tendon strain or tears. The use of ultrasound is significant in revealing tears or ruptures of muscles or tendons, swelling and calcifications but its effectiveness in outlining muscle strains is limited[28,29]. Sports hernia is another possible musculoskeletal source of chronic groin pain increasingly recognized in high-performance male athletes. This clinical entity represents a non-palpable inguinal hernia provoked by rectus abdominal wall weakening or tearing of the posterior inguinal wall[22,30,31]. Clinical examinations reveal tenderness of the posterior wall of the inguinal canal and the superficial inguinal ring which also presents with dilatation. Unilateral or bilateral less often diffuse, deep groin pain is characterized by an insidious onset, halts with rest and exacerbates with sudden movements, coughing, sternutation or sports activities which involve cutting, pivoting, kicking and sudden changes in direction[12,16,22]. Plain radiographic examination, although not diagnostic, especially in the early stages, is of great importance as assists to rule out other sources of groin pain, namely fractures or hip pathologies such as osteoarthritis, femoroacetabular impingement, avascular necrosis of the femoral head or slipped capital femoral epiphysis in the younger heavier athletes. It consists of appropriately oriented weight bearing anteroposterior (AP) pelvis, a Dunn lateral, and a false profile view. It may depict subchondral sclerosis, symphyseal lytic changes and widening or narrowing of the joint space, especially in the chronic phase of the disease[18,32,33]. Another proposed radiographic view, with major contribution to the pubic instability evaluation is the flamingo view in double- and single-leg stance positions[11,34]. This examination consists of an AP view of the pelvis with the patient standing on one leg. A greater than 2 mm vertical pubic subluxation or greater than 7 mm of widening of the symphysis is considered to be pathognomic[1,35]. It has been assumed that up to 5 mm of physiologic motion can take place at the pubic symphysis in asymptomatic individuals. It is worth mentioning that radiographic elements of OP do not represent symptomatic conditions in all the cases found and do not represent independent predictive factors of groin or hip pain[3,36]. Increased alpha angle was found in a study to be the only independent predictor of athletic-related hip and groin pain. Bilateral or less often asymmetric subchondral plate marrow edema extending from anterior to posterior is the keystone manifestation on MRI images when OP is present[1,32,33,38] (Figure 1). The importance of this finding is apparent since it is associated with an increased likelihood of clinically detectable focal pubic tenderness, positive provocative clinical tests, and preseason training restriction. In the chronic phase of OP bone edema may not be present. On the contrary findings originated from chronic sympysis instability, such as periosteal reaction, bone resorption, irregular contour of articular surfaces, osteophytes, and subchondral cyst formation predominate. 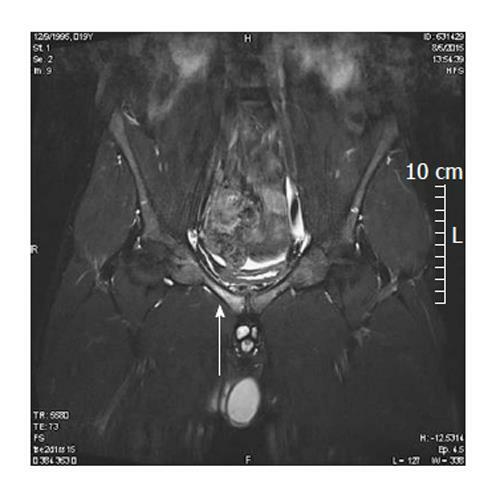 Figure 1 Magnetic resonance imaging - stage I osteitis pubis in a 20-year old soccer athlete. A secondary cleft sign which is an extension of the symphyseal cleft to the adductor tendon origin is another commonly encountered MRI finding in OP[17,33,40]. Bone scintigraphy may reveal markedly increased uptake of 99m technetium-methylene diphosphonate (99m Tc-MDP) in the area of affected pubic symphysis. This finding may be absent for a period of months from the onset of the OP and is not constantly positive in all symptomatic patients[12,15]. A bone scan is also an assistant tool for the investigation of some other musculoskeletal pathologies such as stress fracture or osteomyelitis. Nevertheless poor correlation between isotope bone scan findings and the location and duration of symptoms has been reported. Conservative treatment is the first line therapeutic approach. The pathology is self-limited, but may last a year. Symptoms resolve spontaneously and conservative treatment has beneficial effects[10,12]. Conservative treatment initially includes rest, limited activity, ice and use of anti-inflammatory medication[17,18]. Other proposed treatments include oral and injected steroids and local anesthetic or dextrose prolotherapy, anticoagulation therapy, and compression shorts. Physical therapy appears to be a significant factor for rehabilitation and return to activity. With conservative means symptomatic relief of OP varies significantly from 41% to 100%. Physical therapy constitutes the main conservative treatment approach in athletes with OP for rapid return to athletic activity. The aim of physical therapy is to correct imbalances of the muscles acting upon the pubic symphysis, the alleged cause of OP. Treatment consists of a progressive therapeutic exercise program, involving stretching, pelvic musculature strengthening, physical agents and a progressive running programme[2,11]. Choi et al in 2008 presented a systematic review, including five case report series of 42 athletes clinically and radiologically diagnosed with OP or pubic osteomyelitis, who followed a conservative rehabilitation treatment and/or anti-inflammatory medication. Out of 42 athletes, 41 followed a progressive exercise protocol. In 1 of the 5 case series, 35 male soccer athletes presenting with OP, 71.4%, were evaluated as stage I. In addition progressive rehabilitation program and medication, physical agents such as electric stimulation, laser, ultrasound, cryomassage were implemented. Return to play time ranged from 3.8 to 13 wk in 41 out of 42 athletes, average, was 9.55. In the aforementioned 35 athletes and athletes with less severe OP, mean return to play time averaged 3 wk for stage I, 6.8 wk for stage II, and 10 wk for stage III[11,21]. The effects of an active exercise program were also investigated in a prospective randomized trial including 68 athletes with a median 40 wk of symptoms. They had groin pain associated with adductors, which was either attributed to OP or injury at the insertion of the adductors. The trial included active training program (AT) and passive physiotherapy treatment (PT). Treatment lasted 8 wk. PT treatment included laser, transverse friction massage, stretching of adductor, hamstring muscles and hip flexors using contract relax technique, transcutaneous electrical nerve stimulation according to the contemporary sport injury. The AT targeted muscle coordination and progressive strengthening of stabilizers of pelvis and hip joints, mainly hips adductor and abdominal muscles. Core stability and endurance exercises were also included. Adductor stretching of the lumbar spine and pelvic muscles also took place. An exercise protocol targeting strength and coordination of pelvic muscles in athletes with prolonged groin pain related to adductor muscles, produced significantly better results than conventional physiotherapy. In 79% of the protocol athletes symptoms resolved and they returned to full activity or higher intensity of training. Only 14% experienced the same results in the conventional treatment group. Research findings appear to underline the significance of multimodal physiotherapeutic management in athletes with OP. Jarosz et al suggests that the implementation of an individualized multi-modal management approach consisting of a variety of physical therapy techniques such as spinal manual therapy, proprioceptive neuromuscular facilitation and mechanically assisted adjusting techniques as well as an individually designed progressive rehabilitation program directed specifically toward an athlete’s physical health deficit and special needs, may contribute to a more rapid recovery from estates pubis. Land and water based active core muscle strengthening exercises, proprioceptive neuromuscular facilitation techniques and manual therapy are some of the essential components incorporated into multimodal intervention approach with emphasis to water based strength and endurance training exercises. Specific muscle groups appear to require targeted strengthening. In a recent study involving isokinetic evaluation of hip flexor strength in soccer players with OP, flexor muscle strength was found to be increased, a fact that had negative results in hip flexor/extensor torque ratio of OP. Therefore the authors of this study propose a strengthening of hip extensors as part of further strengthening of hip flexors. In another research study comparing 25 OP soccer athletes to healthy athletes, the OP group presented with reduced concentric muscle strength of back muscle and eccentric reduction of the strength of abdominal muscles, thus altering the ratio of abdominal to back muscles. This underlines the need for specific goal setting exercise in prevention and treatment. Although physical therapy appears to be effective in conservative OP treatment, especially in the early stages, the results are not based on randomized clinical trials and level IV studies. Further randomized trials are necessary to compare physical therapy to other treatment options, or compare elements of physiotherapy treatment. In that way, evidence regarding the significance of physical therapy in OP treatment will assist in the selection of appropriate treatment options. In a case series by Topol et al 24 male elite kicking-sport athletes with chronic groin pain from OP and/or adductor tendinopathy undertook monthly injections of 12.5% dextrose and 0.5% lidocaine into pubis symphysis, the adductor complex and suprapubic abdominal insertions. Before the application of prolotherapy symptoms lasted for a mean of 15.5 mo. Pain severity was assessed by the use of the visual analog scale (VAS) for pain with sports and the nirschl pain phase scale. Based on the aforementioned scales, athletes presented with statistically significant pain reduction. A percentage of 91.7% elite rugby and soccer athletes returned to full activity after a mean period of 9 wk following the first set of injections. Corticosteroid injection therapy is another adjunctive to core stabilization progressive rehabilitation program for acute and chronic OP[19,21,48,49]. Typically, the procedure encompasses 1-3 injections (mean = 1.24) into the pubic sympysis of a 1-3 cc volume mixture consisting of a combination of a corticosteroid such as dexamethasone, betamethasone or methylprednisolone with a local anesthetic such as bupivacaine and lidocaine. In a study presented by O'Connell et al 14 male and 2 female elite athletes aged 21-40 years old with radiographically confirmed chronic OP, underwent pubic cleft injections with 20 mg of methyprednisolone acetate and 1 mL of 0.5% bupivacaine local anesthetic. Symphysography with fluoroscopic guidance was used both for diagnostic and therapeutic purposes. Two months after the procedure, 31.2% of the study population had been completely symptoms alleviation symptoms and all of them remained without symptoms at 6 mo. Choi et al reviewed 3 case series including totally 30 patients, 26 male and 4 female athletes with OP, who were treated with corticosteroids injections with or without local analgetic. The majority of treated with technique athletes videlicet percentages as high as 58.6% were able to return to sport. However, a significant non-responder rate (20.7%) was present. The existing data related to this curative modality is based on studies evaluating the efficacy of a variety of medications with non-standardized volume applied to heterogeneous study population samples. Furthermore, the reported return to full athletic activity is inconsistent and an assortment of results has been reported ranging from quick recovery to prolonged convalescence. Surgical intervention is warranted for the 5%-10% of individuals recalcitrant to conservative approaches cases lasting more than a few months. A wide range of surgical treatment options for OP has been instituted counting interventions such as wedge resection[10,15], total resection, extraperitoneal retropubic polypropylene mesh placement[51,52], open and endoscopic curettage of the pubic symphysis[17,53-57], and arthrodesis and plating fixation with or without grafting[15,35,58]. Wedge resection of the symphysis pubis appears to be an effective treatment which significantly alleviates symptoms originating from OP and secures return to full activity at an average of fourteen months postoperatively. However, posterior instability and pain following this procedure may urge the need of further surgical involvement and bilateral sacroiliac arthrodesis. Paajanen et al placed a polypropylene mesh into the preperitoneal retropubic space in five elite male athletes suffering from OP associated groin pain. One to two months after surgery all 5 patients were able to come back their athletic activities uneventfully. No postoperative complications associated with the procedure were recorded. Two case series including eight male athletes who underwent pubic fusion with compression plates to address long lasting symptoms attributed to chronic OP were reviewed by Choi et al, Williams et al and Vitanzo et al. Seven participants in this study returned to sport with approximately 6.6 mo following surgery. All seven athletes were able to return to sport all were pain free at an average of 52 mo after surgery. Nevertheless, a noteworthy percentage of postoperative complications as high as 25% were noted. More specifically haemospermia has been referred in one athlete whilst another one presented intermittent scrotal swelling during exercise. Radic et al retrospectively evaluated the results of pubic symphysis curettage in 23 athletes with recalcitrant OP with a mean result of discomfort of 13.22 mo. Sixteen participants in this study were able to return to full sport activity by a mean of 5.6 mo after this surgical intervention. However, with longer follow up less satisfied results were calculated and moreover, one required late surgical fusion of the pubic symphysis. A minimally invasive curettage of pubic sympysis which allows bleeding cancellous bone to remain while simultaneously protects the stabilizing pubic ligaments, was proposed by Hechtman et al. The authors of this study performed an arthroscopically assisted on four competitive football athletes diagnosed with OP after a failure of conservative treatment at least for 6 mo. Αll 4 patients returned to competitive athletics on average at 3 mo. A novel operative treatment for the management of chronic groin pain in five competitive soccer players with OP with concurrent adductor longus tendinopathy introduced by Hopp et al. After failure of a minimum of 12 mo of conservative treatment patients underwent a two-portal arthroscopic curettage of the degenerative fibrocartilaginous disc tissue and subsequent reattachment of the soft tissues with suture anchors. All patients recovered to full activity sports after an average period of 14.4 wk without any developed pubic instability. An intraoperative bleeding complication which necessitated ligation was reported. Finally, in a recent research, including 7 young adult patients suffering from OP with concomitant femoroacetabular impingement the results of arthroscopic surgery and endoscopic pubic symphysectomy were evaluated in a mean follow-up period of 2.9 years. The VAS score, and the non-arthritic hip score measurement revealed postoperative improved values in comparison to the preoperative ones. Postoperatively scrotal swelling that resolved spontaneously was the only complication in two male patients. Another patient underwent pubic symphyseal arthrodesis because of continued pain. Given the lack of randomized controlled trials comparing the efficacy between the different surgical treatments, are not reasonable safe conclusions about the clinical effectiveness of each one of these various invasive therapeutic strategies as well as cost-effectiveness of each of them[1,21]. OP is a noninfectious inflammatory disease affecting the pubis sympysis which may provokes groin pain in professional athletes who participate in sports involving strenuous repetitive motions like sudden accelerations and decelerations resulting in joint hypermobility. Most of cases respond sufficiently to usual conservative treatment for overuse injuries videlicet rest, ice, anti-inflammatory medication and physical therapy agents. However, in cases resisting to the non-operative management, surgery is considered as a therapeutic option. This includes a number of approaches such as wedge or total symphysis resection, open or arthroscopic curettage and pubic symphysis arthrodesis. Further, significantly strong research is needed to clarify the superiority of each one of the aforementioned invasive methods over the other and the optimal therapeutic strategy for every competitive athlete.